Termeh is a hand-woven cloth made in Iran and primarily in the Yazd province. 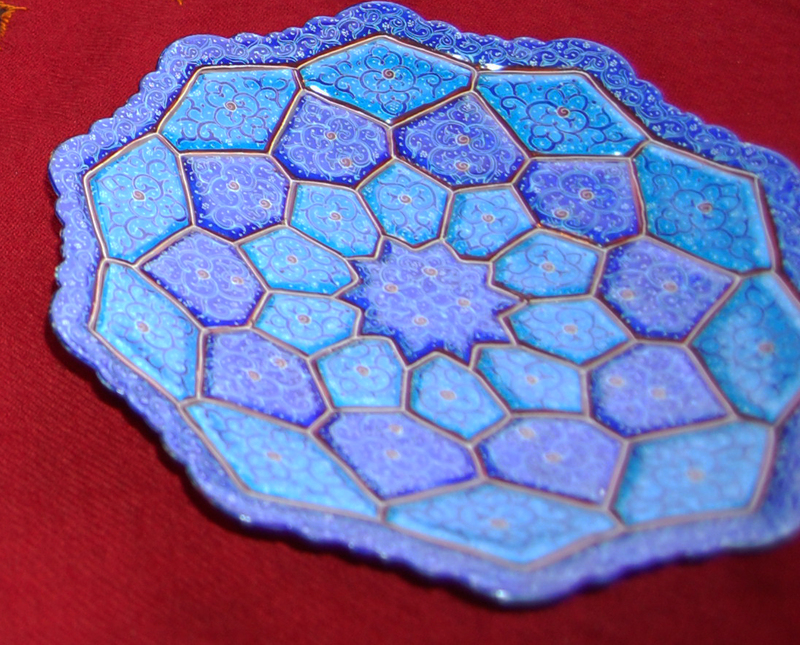 However, it is produced in Isfahan province as well. In Weaving Termeh, very fine and soft wool with tall fibers as well as silk is used. In those very precious ones, you may also see gold and silver strings. The background colors which are used very often in Termeh are jujube red, light red, green, orange and black. 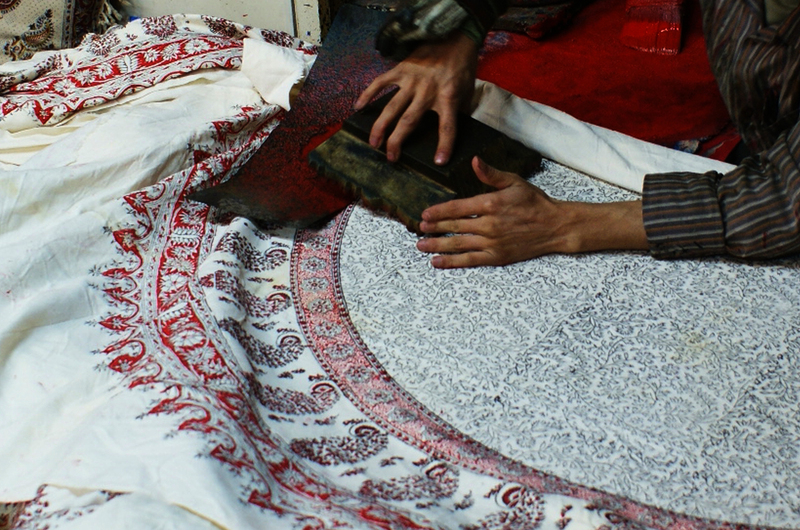 Termeh is woven by an expert with the assistance of a worker called "Goushvareh-kesh". Weaving Termeh is a sensitive, careful, and time-consuming process and a good weaver can produce only 25 to 30 centimeters a day. 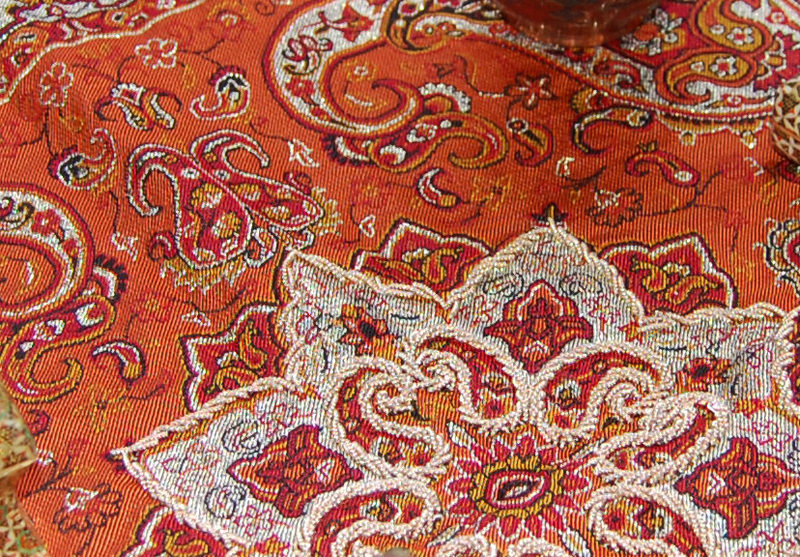 It is used for scarves, clothes and as the table cloth on coffee table, dinner table, or bedspread and cushions. 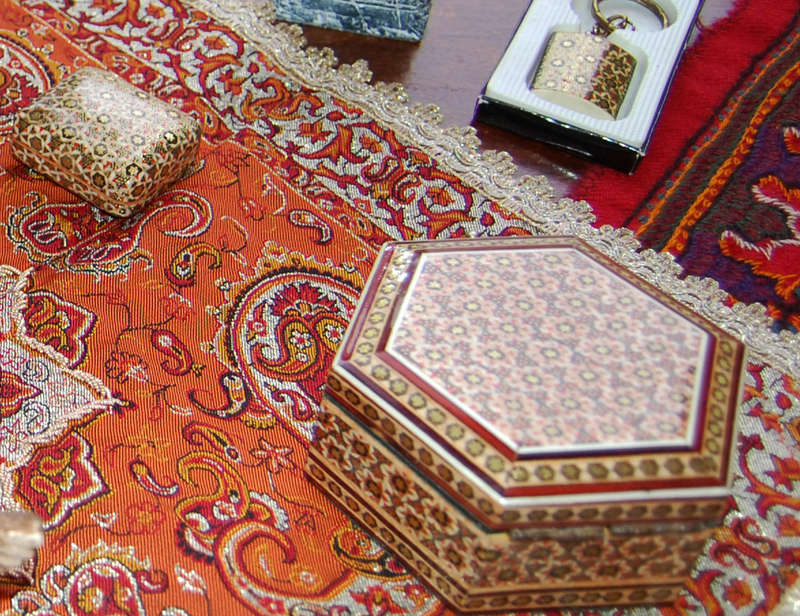 Mina is a distinguished handicraft in Isfahan and is defined as some sort of colored coat which can be stabilized by heat on different metals particularly on copper. To prepare an enameled object, the following steps are used. First, the object which is usually made by a coppersmith is chosen. Then, it is bleached through enameled working which is known as the first coat. It is then put into a seven hundred and fifty degree furnace. At this stage, the enameled metal will be coated with better enamels a few more times and again reheated. The object is then ready to be painted. The Isfahani artists are inspired by their traditional plans as arabesque, Khataii (flowers and birds) and use fireproof paints and special brushes to do that. The enameled material is put into the furnace again and heated at five hundred degrees. This causes the enameled painting to be stabilized on the undercoat, creating a special "shining" effect. Most of today's enamel workings are usually performed on dishes, vases and round-shape boxes in various sizes. The colors are varied too, but blue, turquoise and green are the most common and popular. It is the art of engraving and embossing elaborate designs, patterns and shapes on metals such as copper, silver, gold, and brass. It is widely used to make decorative trays, plates, vases, pitchers, etc. This magnificent art has a long history dating back to more than several thousand years ago. The most recognized centers for the production of Qalamzani are currently in cities of Isfahan, Shiraz, Tehran, Tabass, and Kermanshah. The engraving process is done by hammering special and simple tools on the metal. 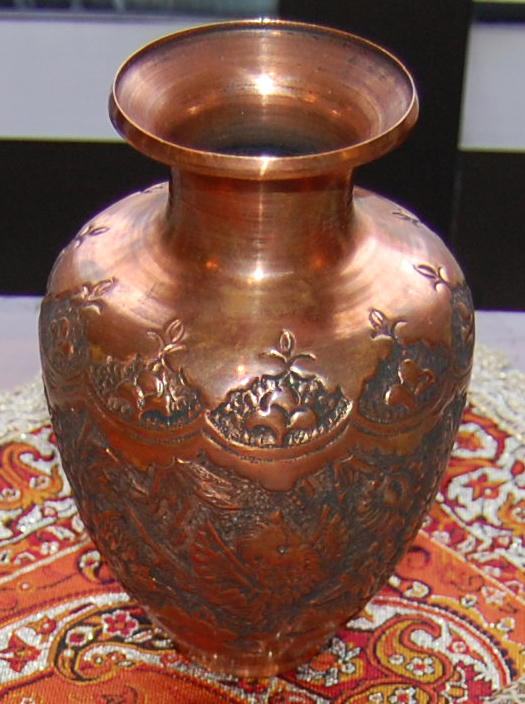 To prepare the metal and specially the copper for engraving, the tar is melted and poured into the object if it is a bowl or a vase or if it is a plate or a frame, a layer of copper is laid over the tar to ensure the surface is not damaged or not hammered out of shape when the creative work begins. The craft of woodblock-printing on cotton tablecloths, bedspreads, and curtains is a specialty of Isfahan in which the cotton cloth or textile decorated with block-printed or painted designs in multiple colors. Khatam is a Persian version of marquetry which is made by decorating the surface of the wooden articles with delicate pieces of wood, bone and metal usually brass (for golden parts) precisely-cut geometrical shapes. Gold and silver are also used. Artworks with smaller inlaid pieces are generally more highly valued. This craft consists in the production of incrustation patterns generally star shaped. The Sticks of wood, bone and metal are assembled in triangular beams and glued in a strict order to create a cylinder whose cross-section is the main motif: a six-branch star included in a hexagon. These cylinders are cut into shorter cylinders, and then compressed and dried between two wooden plates, before being sliced for the last time, in 1 mm wide tranches. These sections are ready to be plated and glued on the object to be decorated, before lacquer finishing. The tranche can also be softened through heating in order to wrap around objects. Many objects can be decorated in this fashion, such as: jewelry or decorative boxes, chessboards, cadres, pipes, desks, frames or some musical instruments. Khatam can be used on Persian miniature, realizing true work of art.